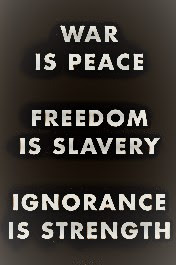 Some time ago I uploaded a post that featured the 1954 BBC TV version of George Orwell’s 1984. 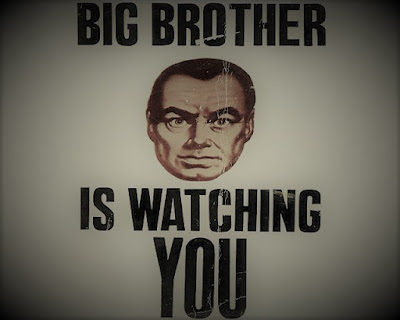 Since then, other screen versions have been made and reprintings of Orwell’s work have appeared, but fewer and fewer people seem to be prepared to heed the warnings that are contained in his fictional story. We modern-day techno-natives continue to willingly hand over our personal information and privacy to corporations and institutions in return for shiny technological trinkets and the glittering promise they offer us of an inter-connected way of life. It is a way of life we cannot function in unless we check the box acknowledging that we agree to their unfair, unreasonable and often incomprehensible conditions. Politicians and the media fill up our minds and hearts with paranoid delusions and a multitude of fears and then offer us an irresistible “national security” blanket - as long as we cast off and hand over to them the last vestiges of our long held civil rights and remaining personal privacy. In my own country of Australia, on October 5th, 2017, the individual State Premiers and the Federal government agreed to the establishment of a national data base that will contain the photos of all licensed car drivers. It is proposed that various venues such as shopping malls, sports events, tourist thoroughfares, etc., will have facial-recognition technology installed which will give the authorities real-time identification of people (based on the photo data base) suspected of involvement in terrorist activities. We are assured that the photo data base and facial recognition technology will not be linked to CCTV surveillance (which is another aspect of modern life we could discuss at length), but does this ring true considering the current capabilities of surveillance technology? We don’t need assurances from silver-tongued politicians. We need concrete legal safeguards! Such a proposal sounds Ok on the surface. However, along-side this announcement, it was also proposed that the time a person can be held in detention and who is suspected of being involved in terrorist activities, be increased from one week to two weeks before they are charged or released. The chilling aspect involved in such measures is that everyone virtually becomes a suspect to some degree. In addition, much is made of the sentiment that the activities of criminals and terrorists ought not to alter our democratic way of life and values. But as we can see, our values, way of life, freedoms and judicial / political traditions are being altered! Isn’t that what our perceived enemies would want? Another chilling aspect of all this is how people willingly acquiesce to something they have not been consulted about nor are aware of what kind of safe-guards and protections would be put in place. The same lame, brain-dead argument is trumpeted throughout talk-back land that suggests that if people have nothing to hide then they have nothing to fear! Are you kidding me? That is the kind of mantra that Big-Brother tyrants would use to justify their intrusion into people’s personal lives and their stripping away of people’s freedoms and liberty. Yet another equally idiotic argument is offered up to the gods of apathy and complacency: Since we have handed so much of our personal information and privacy to institutions and the state, what does it matter if we hand over a bit more? That’s the point, fool! Once the door is opened a crack, you can be sure that it will over time be forced open ever wider for you to enter the land of 1984. Once freedoms, liberties and privacy are handed over on a promise of “Trust Us” you can sure they’ll never be handed back without a fight. You can also be sure (as you place your fingerprint on your phone’s screen, show you face to your phone and put on that wearable technology) that the kinds of proposals as outlined above are just a prelude to each and every citizen being required to possess a photo identity card which will have a chip containing all our personal information which we will have to produce on request (demand?). Without such a card, we will find it impossible to function in our society. Didn’t we fight wars in the past just so we wouldn’t have to live in such a world?